Our February rider interview comes from Nick McCaffrey, Director of Operations at Gather & Gather. 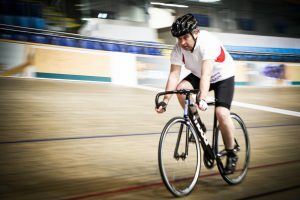 Nick was team captain of the Mitie/Rolls Royce team who took part in our Derby Arena challenge earlier this month. 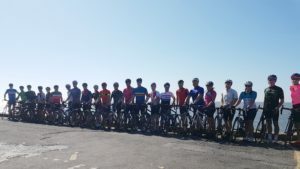 Nick & his team took on Cyclone24 in support of Rainbows, and in doing so raised over £4000 for the charity. We chatted to Nick to find out his inspiration for taking part in Cyclone24 and how he felt during the challenge. How did you first find our about Cyclone24? Alison Furlong who is the Rainbows Community Fundraiser and friend of mine approached me to see if I would be interested in taking part in the event on behalf of Rainbows around August last year. I have completed many challenges on behalf of Rainbows and it was a no brainer really, I raise money annually for Rainbows and saw this as a great focus not only for me but for some of my colleagues that I work with as well. 3 guys from Mitie and 3 guys from Rolls-Royce was the idea, collaboration, team work and generally an event that would test our fitness and mental resolve. My job means that I travel weekly, mostly internationally so I had to get organised, Week days mainly spent on a static bike in the hotel gym, weekends on my turbo trainer in the spare room, many many years ago I used to run to a very high standard, I ran for England a few times, Cross Country so I have a good engine anyway which helped so I just focused on trying to replicate the overall challenge in terms of interval and long sustained efforts on the bike. I also gave up drinking booze from New Year’s Eve which help me loose a few pounds. The speed of some of the big boys especially from the Derby Institute of Sport team. The way different teams organised themselves and tackled the event. The tandem athletes, boy could they move and I guess being visually impaired and being 2 up is some feat. My team members and the way we worked together, supported each other and in our view smashed it. We had split our efforts into 24 minute segments which meant we each had 10 sessions to deliver with roughly 2 hours rest in-between each session, on paper it sounded quite achievable, in reality it was quite challenging, personally for me the final few hours were great as mentality I was counting down and I also had the last session which I was planning out my glory lap in my mind (Very Chris Hoyish) – When the bell went with 1 lap to go I knew that as a team we had done it, all of the team were cheering from the side-lines with family and friends and it was all very emotional, I decided against taking both hands off the handlebars and climbed the straight to the top of the track …………………… Amazing feeling, so proud and honoured to be part of a team that had given everything not only to themselves but also to Rainbows. Make sure that you get some track time so that you feel confident, google past events and really get to see what it is all about, set up a WhatsApp group with your team members so that you can all start to be part of a community, share your training schedules and any sessions with your team mates. Make sure that you prepare correctly for the actual event in terms of food, drink, rest and clothing. Do some training, mentality prepare for being awake for at least 24 hours and most of all GO FOR IT as anything is possible with the right mental attitude. We’re already hearing that Nick and the team will be back for our 2019 Derby challenge and we can’t wait to see the team again….especially if there’s another pizza delivery scheduled! !